Where can you take art classes in Erie? Just to name a few options, kids have great opportunities – outside of school – at places like The Inner-City Neighborhood Art House; while both kids and adults alike can learn a wide variety of creative skills through The Erie Art Museum, which has classes both on-site and at 1505 State Street. Ceramics enthusiasts are encouraged to mold their talents at Claytopia, and stained glass artisans can let their skills shine at The Glass Stop. 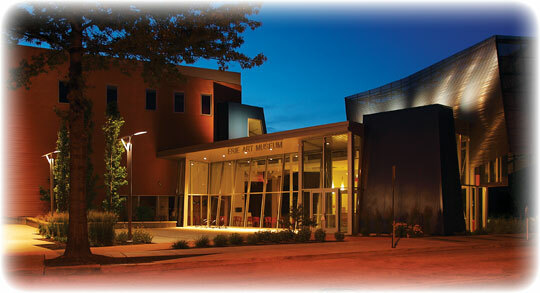 The Erie Art Museum, located at 411 State Street, is a non-profit, member-supported community organization that boasts a year-round programming schedule: art exhibitions, classes, workshops, concerts, group tours, art in the schools, children’s programs, lectures, artists’ services, traveling exhibitions, publications and more. The museum is home to a collection of more than 7,000 eclectic pieces of artwork, including Tibetan paintings, Indian bronzes, American ceramics and others. All of this is made possible by a dedicated and creative staff including longtime Director John Vanco. The building that houses the museum was originally the Bank of the United States, built in 1839. This original purpose explains the building’s distinctive Greek Revival architecture. The museum serves as the centerpiece of Discovery Square, a cultural and educational center in downtown Erie. Besides the museum itself, Discovery Square is home to a full-service framing gallery and the Erie County Historical Society and Museums. In 2010, the Erie Art Museum underwent a massive expansion project, which included a new patio and museum entrance on East 5th Street, a new indoor performance space, a café and gallery rooms. The museum uses the patio for its Mid-day Art Breaks every Wednesday during the summer, when it offers live music performances and free gallery tours. The Erie Art Museum also hosts the Blues & Jazz Festival, an annual event since 1992, every summer at Frontier Park. The Warner Theatre, located on the east side of the 800 block of State Street, has been a prominent part of downtown Erie since it opened its doors in 1931. The building was commissioned by the Warner Brothers in 1929 as one in a ­series of theatres that the well-known movie studio opened across the country to showcase its films. The Theatre ­features an art deco motif, gold and ­silver leaf, French mirrors and crushed velour, all built at the original, staggering price of $1.5 million. Phase one of a long-awaited and thoughtfully planned restoration of the Warner Theatre began in June 2002. The changes included a new roof and ­rehabilitation of the tapestry, ornate gold leafing, plaster and paint. 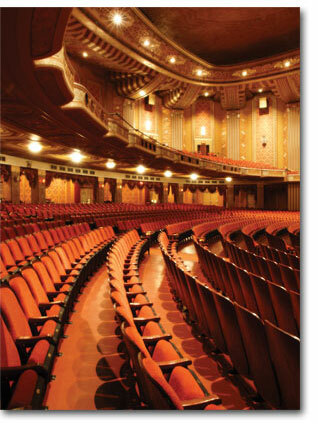 Workers ­installed new seats throughout the ­theatre during phase two, completed in 2003. Phase three expanded the ­theatre, with construction of a new ­entrance and lobby on French Street in 2007. 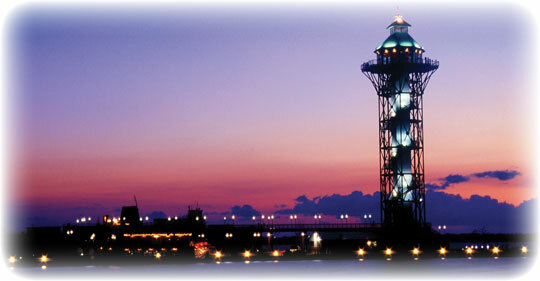 Erie is a city rich in architectural history with a number of structures to provide insights into its colorful past. As Erie’s oldest structure, the Dickson Tavern, located at West 2nd and French streets, is a prime example of historical architecture. The building was constructed in 1815 by John Dickson and served as a tavern under a succession of innkeepers until 1841. In that year, it was converted to a home, and in 1924, the city rescued the structure from impending demolition. The Watson-Curtze Mansion is another of the city’s architectural treasures. The Richardson Romanesque building was constructed in 1891 and contains stained glass windows, mosaics, friezes, marble fireplaces, and decorative woodwork. 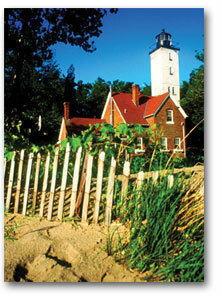 Erie has two historic lighthouses: the Presque Isle Lighthouse on the peninsula and the Land Lighthouse located at the foot of Lighthouse Street on Erie’s east side. Other well-known historical buildings include the home of Erie Art Museum and the building adjacent to it, the Cashier’s House. Many of Erie’s historic buildings are under the care of the Erie County Historical Society and Museums, an excellent resource for more information about Erie’s rich past. Many professional artists in the Erie area belong to the NPAA (Northwest Pennsylvania Artists Association) or the PIAA (Presque Isle Artists Association). 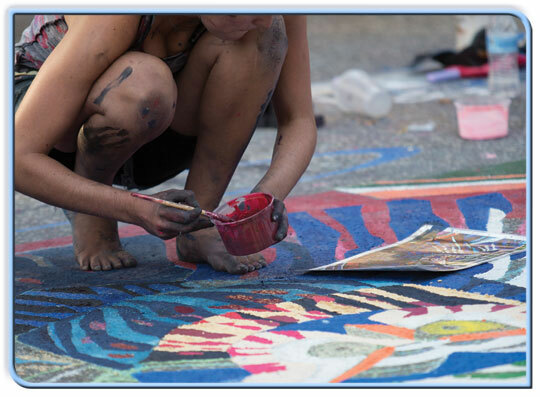 The Arts Council of Erie is a vital catalyst for the countless regional endeavors and the non-profit group Artists Incorporated has created numerous important and successful projects around town. 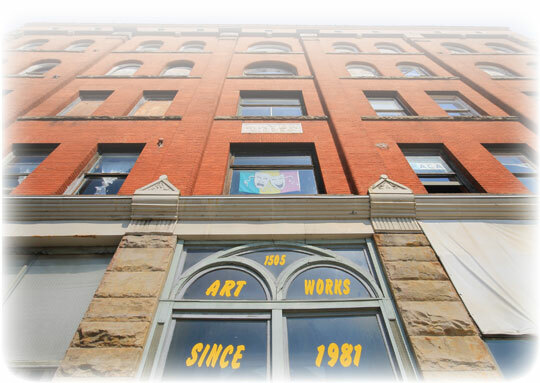 The Inner-City Neighborhood Art House, located at 201 East 10th Street, provides free lessons in the literary, performing and visual arts to over 500 inner-city children each year. Most programs take place after school, on Saturdays and throughout the summer. In addition to its art classes, the Inner-City Neighborhood Art House also offers tutoring and one-on-one reading programs. The Benedictine Sisters of Erie, who started the program, believe the need for the arts in the lives of the poor is as real as their need for bread. If there’s such a thing as an artists community in Erie, it would have to be 1505 ArtWorks, located, by no coincidence, at 1505 State Street. The building itself had a rich history before it became studio space for local artists. It was built by the Mayer Brothers Construction Company in 1899 as a headquarters for their business. Later, however, it served numerous light industry uses: a spice mill, a makeshift hospital, an electric company and a furniture company to name a few. Then in 1988, Dave McGeary and his father purchased the building. “A bank owned it at that point,” remembers McGeary, “and it was in pretty bad shape. They wanted to get it off their hands, so we got it at a decent price.” McGeary didn’t have plans for it right away, but when artists kept asking if studio space was available, the idea for ArtWorks was born. McGeary, who had had construction experience, made the interior into 35 separate units, including 14 painting studios, two photography studios with darkrooms, and four darkrooms for renting to the public. The idea worked. Despite the cliché of the starving artist, ArtWorks retains a 90 to 95 percent occupancy rate throughout the year. McGeary is often forced to turn artists away because of its popularity. The variety of the artists in the building is just as unusual as the idea. With dozens of small art galleries around town, patrons are sure to find work in a variety of media: painting, sculpture, photography, furniture, and jewelry. Show openings draw nice crowds when promoted well. Stores such as Kada Gallery, Glass Growers and a la Carte have gained local reputations for consistently presenting beautiful objects. Spaces such as Urraro Gallery and Erie Art Museum Frame Shop are known around town for displaying an eclectic mix of shows which tend to lean towards the cutting edge. While the focus of U Frame It is – you guessed it – framing, art objects are not foreign to its walls. The Bayfront Gallery is a co-op of local artists who collectively pack the walls with their work in a renovated space tucked into Dobbins Landing. Local pen and ink artist James E. Sabol makes his work of regional landmarks available in his west side gallery. If you would like to support the arts, look for show openings and reviews listed in the Showcase, which is a supplement to the Erie Times-News published every Thursday. The Boston Store at 718 State Street takes its name from Boston, Massachusetts, which was a center of fashion and culture in 1885 when Elisha H. Mack founded the store. The current structure, the third with the same name, has over 10 acres of floor space, occupies two-thirds of the block, and was completed in 1931. The retail “Boston Store” closed in 1979 after 94 years of business. 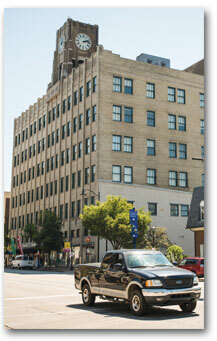 Today, the building retains its name but offers apartments and office space. Patrons frequent the Gastropub Under the Clock bar and grill located on the bottom floor of the building. The Boston Store is also home to Erie radio stations owned by Connoisseur Media. Passers-by on State Street can wave through large windows at radio personalities in the studios. 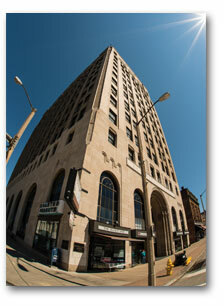 At 14 stories tall, the Baldwin Building, located on the corner of 10th and State, is the tallest and one of the best known buildings in Erie. It was originally known as the “Erie Trust Building,” so named for the Erie Trust Company that unveiled the structure in 1925. Officials and businessmen saw the building as a symbol of modern power at the time of its construction, and it was Erie’s attempt at a Manhattan-style skyscraper. The building didn’t become known as the “Baldwin Building” until G. Daniel Baldwin and his brother Isaac bought it at auction for $465,000 in 1943. Over the years, the building deteriorated and was again purchased at an auction in 1996 by Tom Kennedy for $315,000. Today known as the Renaissance Centre, the building provides more than 150,000 square feet of office space to numerous Erie businesses, as well as access to a 500-space parking ramp. Despite its numerous name changes, the building retains the brick and limestone façade and ornate arched entrance that have made it a downtown Erie landmark. 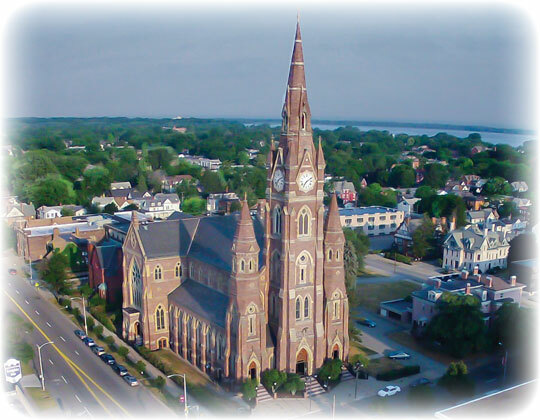 Erie is noted for the beautiful architecture of its churches. While the list is too extensive to name them all, the First Presbyterian Church of the Covenant is one worth mentioning. Located on the 200 block of West 7th Street, the First Presbyterian Church of the Covenant was built between 1929 and 1930 at a cost of more than $1 million. The 20th century Gothic structure has a base of limestone, while the remainder of the exterior is seam granite. Other notable features of this church include its numerous interior stained glass windows and exquisite carved woodwork. Another well-known Erie church is The Church of the Nativity of Christ. It is impossible to miss its onion-shaped dome at 247 East Front Street. Better known to the public as the Russian Orthodox Church, it was built in 1987 after the previous structure was destroyed by a fire in 1986. It is well known for the icons, or religious images of Jesus and the saints, that line its inside walls. Also noteworthy is one of the older churches in Erie, St. Patrick, located at 130 East 4th Street. Saint Patrick’s congregation, which dates back to 1837, built two other churches before completing the current structure between 1903 and 1906 at a price of $180,000. The life-sized Stations of the Cross, or statuary depicting Christ’s march to Calvary, are among the church’s best-known features. The pieces were the work of master German woodcarvers who spent more than three years creating them. The church underwent a massive restoration in 2012, with new paint and marble flooring as part of the changes.